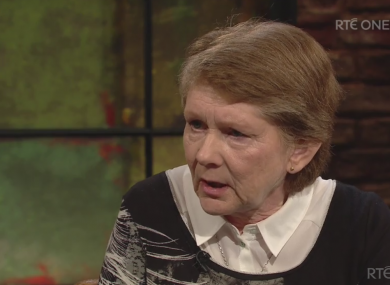 CATHERINE CORLESS, THE local historian who helped uncover the substantial remains at the Tuam mother and baby home through her work appeared on The Late Late Show on RTÉ this evening. She told the story about how she managed to uncover evidence about the remains of babies at the Tuam home, and how the week following the revelations has been. She began: “I didn’t really expect such an influx of media. I kept with it, I kept answering people and talking to people. Like back in 2014, I did the same thing again. I just facilitated people. It was just something to get the story out again. I was hoping and hoping that they would come to the truth. It’s wonderful that the truth has come out. Every scrap of research I had done said that the children were buried on the home grounds. She talked about how she had noticed children from the home as a child, and later researched the topic in later life. Corless discussed how each child would be fostered out following their communion, with many never seen again at the Tuam mother and baby home. She described how mothers would be sent away from the home a year after the child was born. The mothers were given tasks to do in the home, and only allowed to see their babies when breastfeeding them. They were literally let in to feed the baby, and then it was back out to their chores. She said she had decided to investigate the home because of her memories of the site as a child. “I always had that memory of passing that stretch of wall, and wondering what was inside it,” Corless said. Upon discovering the death certificates of the children, she became determined to find out where they were buried. A previous discovery of bones had been dismissed by authorities as Famine victims, but Corless’s maps and findings suggested that this couldn’t be the case. She contacted the Bon Secours, Galway County Council and other authorities and none had details about burial records. Despite this, she did manage to track down the death records of over 700 children in the home. No burial records here whatsoever. [Where they were buried] was the question I had to ask myself. I wasn’t shocked at the find because I knew they were there. Corless praised the reaction of Katherine Zappone for her honest assessment of the situation when making a statement last Friday. When asked if she thinks this was an isolated case, she said she believed there were many mass graves at mother and baby homes around Ireland. When she finished speaking, Catherine Corless received a standing ovation from the audience on The Late Late Show. Also appearing on the show was Peter Mulryne, who described how the local priest wanted his mother removed from the parish, when she was seven months pregnant. He was subsequently born and brought to the Tuam mother and baby home. I was born in UCHG and she [his mother] was sent to Tuam. Years later, he received word from Catherine Corless that he had a sister. He has a birth cert and a death cert for her. He knows his sister died, but has no record of what happened to her or where she is buried. I want to know where she is. Is she there? Is she there tonight? I will not rest until I find out. I’m looking for a file on her life while she was there, and they haven’t got it. Anna Corrigan’s mother had told her that she had two babies in the Tuam mother and baby home. She described how one brother died at age 18-months. She said that, written on John’s death certificate, was the term “congenital idiot”. Her other brother, William, has no death cert, or medical cert. “All I have to rely on is what the nuns are telling me,” she said. Her mother had said, before she died, that a son had been adopted and sent to America. I’m an only child. I would really like to find my brother. What I’d like is to find them. I want the bodies DNA-d. I want to reclaim them if they’re there. I want answers. Email “'I wasn't shocked, I knew they were there': Catherine Corless receives standing ovation on Late Late”. Feedback on “'I wasn't shocked, I knew they were there': Catherine Corless receives standing ovation on Late Late”.